I was commenting to Pat over at the Back Porch that I would love to have Blue and White Dishes. And about a week later I was in my favorite antique shop and found this perfect set of dishes just for me. Four dessert plates and Four cups and Four saucers. I collect this combination for my tea parties. I have 19 sets. Some of the sets have more than one of the same design. 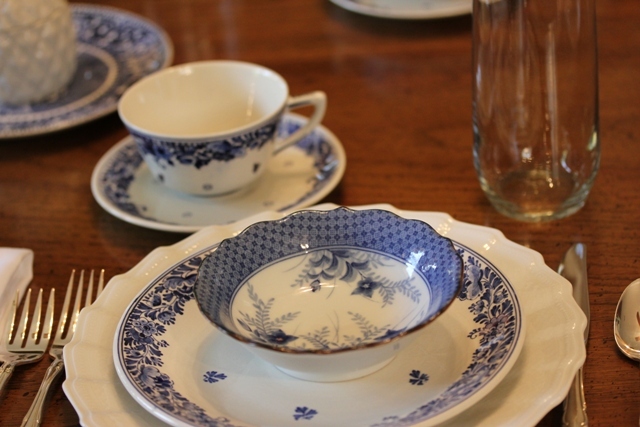 Ladies love to pick out their favorite place setting and enjoy discussing different tea cups or dishes they collect. 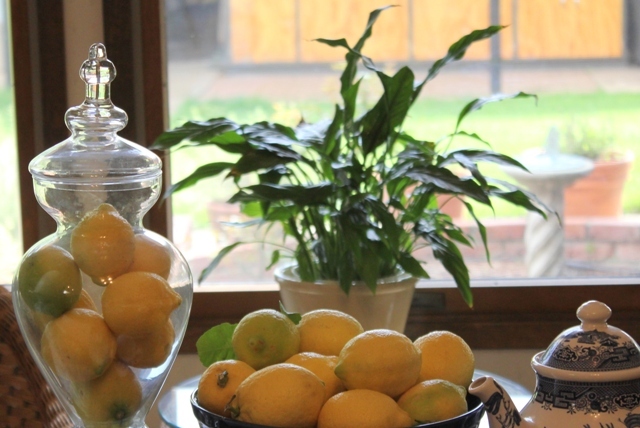 While making Lemon Curd I decided to use the seasonal lemons as the centerpiece for my 24th. Tablescape. I love to serve a fruit dessert as part of my tea menu. I love this cup. When I buy tea cups I want to love how it feels in my hand. Not to heavy. And the way it looks when I hold it to the light. Also I look for the used cups to be in good condition... That's so important. 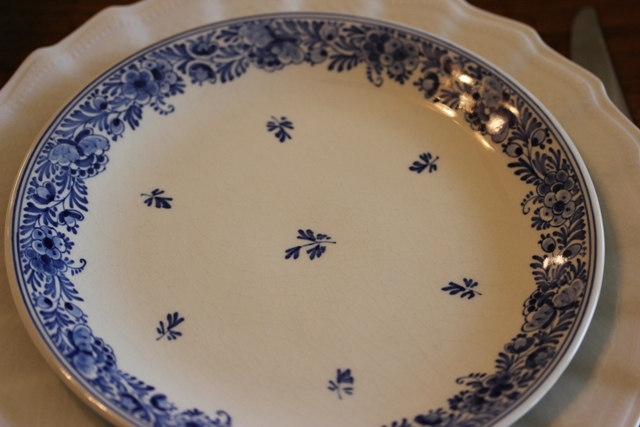 I love the presentation of the blue and white plates on a larger white plate. I have a very nice wooden table that I have covered all the time. But today I wanted the wood to show under the place setting. 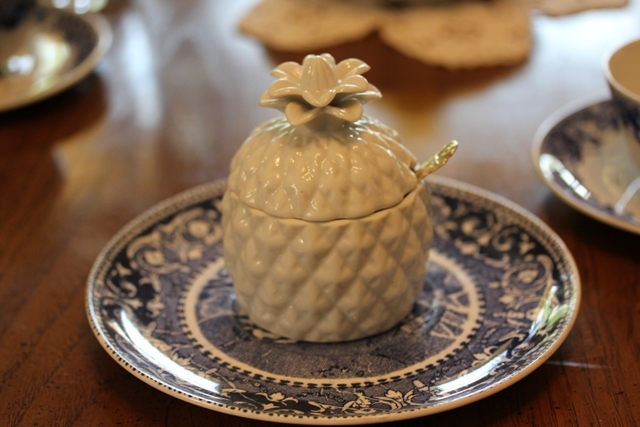 The Pineapple is the symbol for "Friendship"
I believe having tea is the most wonderful way to share friendship. I bought this tea pot at the Save Mart grocery store last year when I was visiting my mother. I wish I had bought more pieces of this wonderful Blue and White dinnerware. The sugar and creamer I found in a little antique shop. My son gave the bowls to me as a gift many years ago. They are such a treasure. 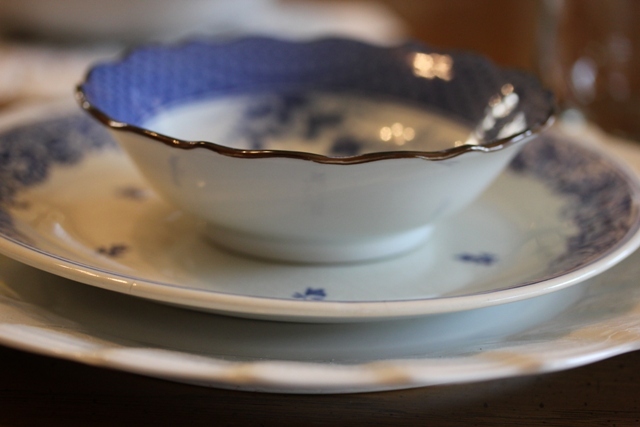 At the time he gave them to me I didn't collect any blue and white dishes. How did he know that one day I would have so many beautiful dishes. 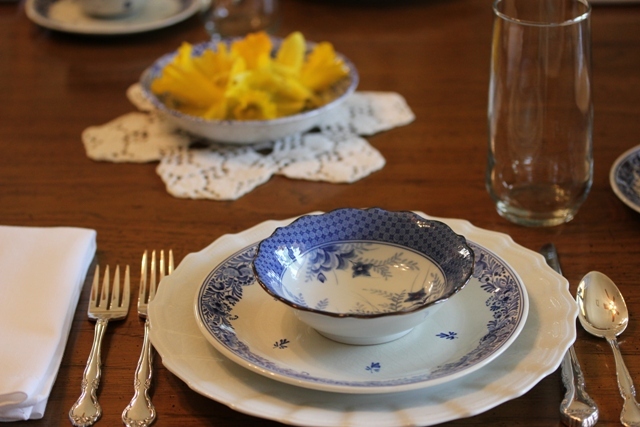 This photograph has the water glasses included in the Tablescape. Water glasses were taken away. Which look do you like? Glasses or No Glasses that is the question. Some great linky parties are going on the next few days. Please link back to the Myriad of wonderful blogs. 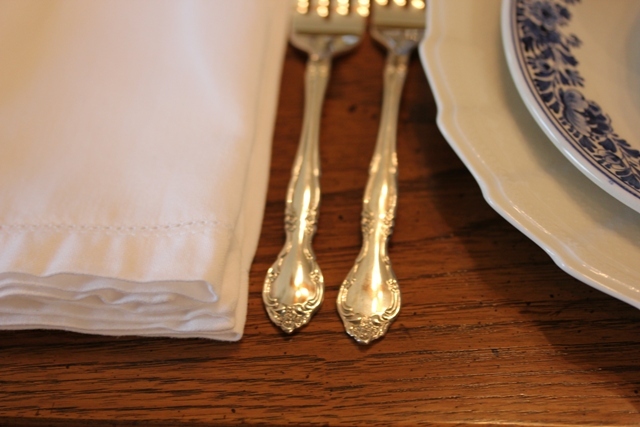 Love the blue and white tablescape. Blue is my favorite color. Looks so fresh and springy. Thank you for sharing. 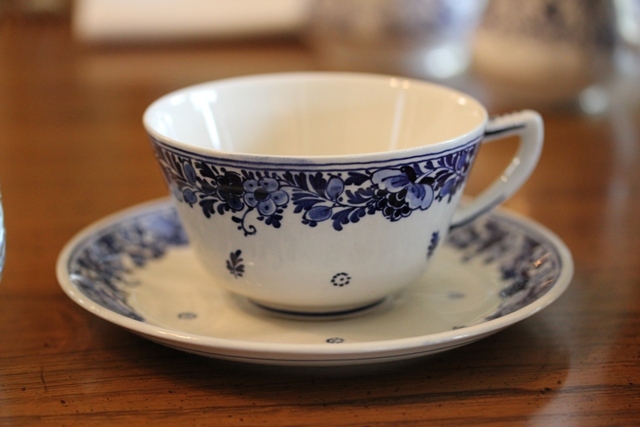 Your Royal Delft dishes are gorgeous! 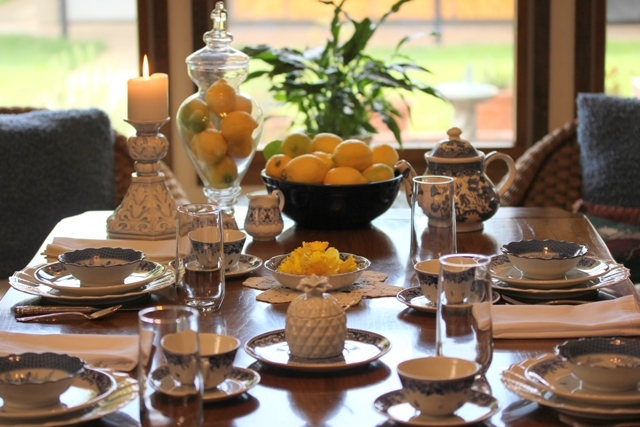 I just love your tablescape design with the lemons. I think the picture without the water glasses is my favorite. This is my first time joining the group. Have a great day! I have been thinking the same thing about blue and white dishes. Everything is so lovely Betty. I adore that little pineapple container. I love how everything blends and you can keep adding to. I love blue and white and all of yours look so pretty. Have a nice day. So many pretties! Congrats on your new (and 19th!) set of dessert dishes! That little pineapple dish is adorable, and just perfect for serving your homemade lemon curd! 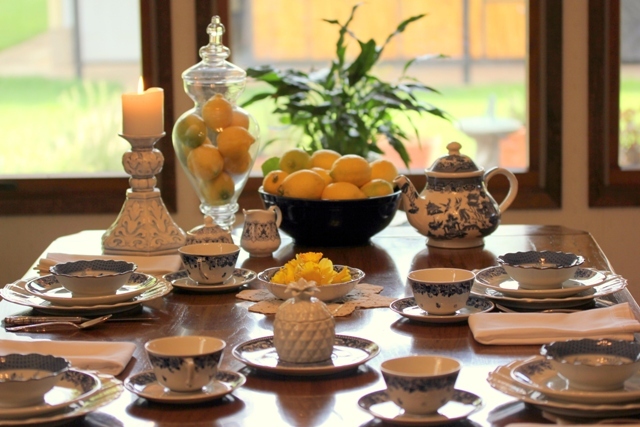 I love the combination of blue and white and yellow, and your table looks spectacular! Love your table...blue and yellow is so cheery. That little pineapple container is really neat. 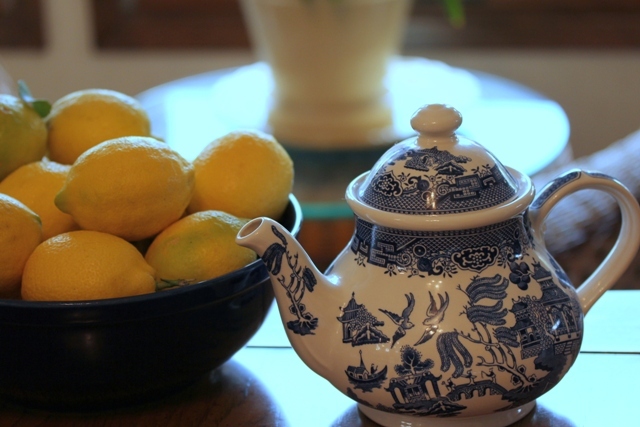 The lemons make a perfect centerpiece. I like the table with the water glasses, makes it sparkle! I love the table with glasses. 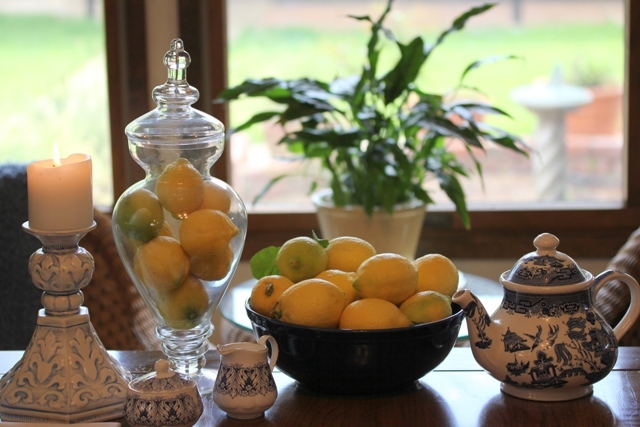 PS..I love the lemons in the lemons in the apothecary jar...so sweet! I love blue and white dishes as well. Love your table and the lemons as the centerpeice are PERFECT!!!! I especially like those bowls! What beautiful dishes!!! They are delightful and so lovely. Your table is perfect! I love blue and white ... it's so *clean* looking and goes with everything! Lovely! Beautiful, Betty! Blue and white is always a fave of mine! Ooo... that pineapple jar is spectacular!.. I LOVE IT SO MUCH!.. 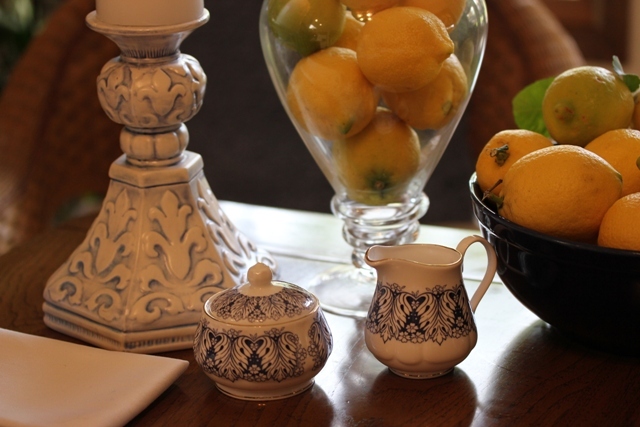 Blue and white dishes and lemon curd - two of my favorite things! Thank you for bringing your table to Seasonal Sundays. Goodness, I just came up and saw this gorgeous table in blue and white. It's simply lovely. Love the dishes! Happy Earth Day.